My main focus has been fiber/mixed media art for the last 10+ years and now I am adding my paintings to the mix. 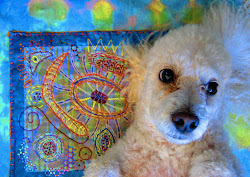 I am also doing dog's in fiber art if you are interested in something completely different! Prices start at 300.00 and up depending on size. All the fiber pieces are hand sewn and hand beaded and take weeks to complete. It's even more gorgeous in person. Thank you Susan... we LOVE it!! !